The summer I turned 12, my grandfather took my cousin and me on a motor home trip through Iowa, the Dakotas, and Canada. We had a great adventure and saw beautiful parts of Canada and the US we had never seen before: Riding Mountain National Park and Clear Lake in Manitoba, the Badlands, and Mount Rushmore. We stayed in KOA campgrounds most nights and for the most part, thoroughly enjoyed the experience. 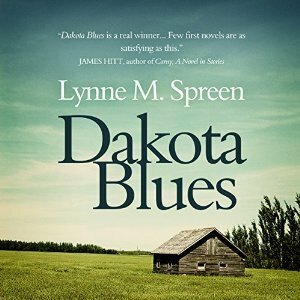 While we didn’t have the quite the experiences Karen Grace has in Lynee Spreen’s Dakota Blues, we met many interesting people and watching my grandfather pull out his typewriter each evening for the newspaper story he would eventually write about this trip got me in the habit of jotting down notes on all my journeys – big and small. Narrating this book brought back the many great memories I have of that trip and I really enjoyed the story, too. When you get a chance, check out author Lynne Spreen’s website, anyshinything.com, for lots of interesting writing on “midlife magic”. Lynne was great to work with on this book and I hope to work with her again in the future.